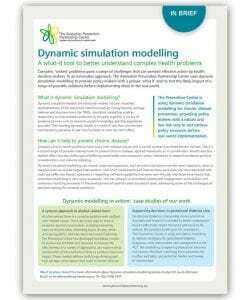 The Prevention Centre is promoting the use of dynamic simulation modelling in health to provide policy makers with a unique ‘what if’ tool to test the likely impact of a range of possible solutions before implementing them in the real world. The team, working in close collaboration with relevant policy partners, has completed 6 projects to date. We are currently building an integrated model of multiple risk factors and chronic harms. What is dynamic simulation modelling? Dynamic simulation models are virtual representations of the real world where individuals and communities act and react, develop health conditions, and use health services in the same way as people do in real life. Informed by a variety of evidence sources such as research, expert knowledge, practice experience and population-based behavioural and demographic datasets, the models can represent complex human behaviours. They can follow individuals throughout life, identifying how their influences and behaviours change, and how their health is impacted over time. They can also map the aggregate effects of thousands of people operating in a complex system, following their interactions and responses to different policies and interventions. A dynamic simulation model is a ‘what if’ tool through which we can test various policy scenarios over time to see which are likely to have the most effect, both on individuals as well as on the system as a whole. The solutions to complex public health problems such as harmful alcohol consumption, overweight and obesity and mental disorders remain elusive, despite hundreds of millions of dollars and decades of research that have led to attempts to combat them through ‘evidence-informed’ policy. This is partly because there are many ways to tackle public health problems, multiple risk factors, and different intervention points during the lifespan. Complex chronic health problems have many inter-related causes and it can be unclear how these factors interact. In addition, there is often a broad range of possible interventions to prevent chronic disease, applied individually or in combination, which must be considered in light of their comparative costs, benefits and health system implications over the short and longer term. Health decision makers often face the challenges of differing stakeholder and community views, limitations in research evidence, political considerations and industry lobbying. Traditional analytic tools for supporting evidence-informed policy are limited in their ability to help policy makers to plan and make decisions. Computer simulation models provide us with a framework for mapping and quantifying complex problems. They provide a relatively low cost and risk-free way of testing the likely impacts and costs of different options for intervening before implementing them in the real world. Dynamic simulation modelling can answer important questions, such as which risk factors are the most important, when in people’s lives we should target interventions, and which combinations of interventions work best, are most equitable and most cost-effective. Why use dynamic simulation modelling? In situations where the likely impact of different combinations of interventions is difficult to predict, the model can provide insights into potential synergistic, additive or lagged effects. Although dynamic simulation modelling has been used successfully in engineering, ecology, defence and business for many years, its value for health policy and planning is being increasingly recognised. The Prevention Centre uses a unique participatory, transparent approach to dynamic simulation modelling. We work collaboratively with our project partners, policy agencies, researchers and other stakeholders to build and obtain the data and evidence inputs that comprise our models. This gives our policy partners confidence in the models’ integrity and validity. It also provides partners with a level of ownership, ensuring they are more likely to interact with the tool and use it to build policy evidence. The Prevention Centre two main modelling approaches: System Dynamics and Agent-based modelling. System dynamics is a system modelling engineering tool that has been in use for over 60 years. It is a quantitative tool that was initially used in industrial management, and which is now commonly used in manufacturing, process-oriented industries, and defence logistics planning and asset lifespan. Today, system dynamics is widely used in climate science as a tool that incorporates ‘what if’ assumptions to analyse the impact of changes on our climate system, from sea level rises to historic temperature change and global CO2. System dynamics takes an aggregate, population level perspective, considering flows, feedback loops and time-delays in a complex system. What questions can our models answer? How and when in people’s lives different interventions should be targeted. We work collaboratively with academics, policy makers and practitioners to map the key risk factors and likely causal pathways leading to the health or economic outcomes we are interested in. This information is combined with empirical evidence and administrative, survey and burden of disease data to create a computer model that represents the real world. We test the model to ensure it accurately represents the population of interest. We can model anything from small sections of the community in different geographic locations to the population of the entire country. We produce a baseline to see what would happen with no new interventions (business as usual). Using a simple interface, we select different interventions, individually or in combination, and target them in different ways to forecast how this is likely to impact the outcomes over the short and long term. Once our models are completed, we have the option of sharing them amongst our key policy agency partners via easy-to-use web browser interfaces, or exporting results to statistical programs for further analysis. Insightmaker (IM) – insightmaker.com is a free-ware simulation tool that runs in most web-browsers. It is used to build conceptual representations of complex systems which can then be converted to computational models through quantifying variables and links. Stella Architect – iseesystems.com is a professional system dynamics modelling software package with user-friendly interface design capability. AnyLogic – anylogic.com is a professional multimethod simulation modelling platform used for our agent-based and hybrid modelling projects. It allows for large population datasets, large-scale models, valuable visualisation and analytical tools and GIS capability. The Prevention Centre has completed a range of projects as both exploratory research studies and as commissioned projects for various state health agencies, including ACT Health, NSW Health, Tasmania Department of Health and Human Services and Queensland Department of Health. Health problems to which we have applied simulation modelling methods include alcohol-related harms, tobacco use and COPD, reducing childhood overweight and obesity and improving diabetes. Further examples of applications in mental health, suicide prevention and healthcare can be found on the Decision Analytics webpage. The Prevention Centre developed a simulation model of alcohol use in NSW that could be used to forecast the effectiveness of a variety of approaches to reducing alcohol-related harm, both individually and in combination. The model addressed both binge drinking and high average consumption that leads to chronic disease. Following from this project, we have produced a simulation model of alcohol use in Tasmania, with input from stakeholders including alcohol and drugs services, youth services, the Liquor Commission, Treasury, Police and the Education Department. A dynamic simulation model developed in partnership with NSW Health is being used to inform strategic planning for the NSW Premier’s Priority on childhood overweight and obesity. The model was built to forecast which combinations of policies and programs would be needed to achieve the Premier’s target of reducing childhood overweight and obesity by 5% within 10 years. This exploratory project is drawing together evidence about the health and economic burden of chronic disease, its preventability and the economic credentials for action. It is using this information to build a national dynamic simulation model using Australian population data that will allow decision makers to explore the likely population health and cost impacts of different interventions to reduce risk factors for chronic disease. A component of this project is building three agent-based sub-models for the ACT targeting reductions in high body mass, smoking and alcohol use. It is planned at some stage these sub-models will be linked to the national system dynamics model architecture. This model is still under development. This project is applying dynamic simulation modelling to the problem of diabetes in pregnancy in the ACT as a case study. This is a world leading tripartite model that includes system dynamics, agent-based modelling and discrete event simulation components. The model considers the short-, intermediate- and intergenerational implications of the increasing prevalence of risk factors for diabetes in pregnancy, and will inform investments in healthcare and population level interventions. The Queensland Government commissioned a dynamic simulation model to inform its smoking reduction strategy by identifying and testing key priority interventions to see which are most likely to make an impact. The research simulation study utilised the data from adults in NSW and Australia including the data from the Sax Institute’s 45 and Up Study. The model captures detailed smoking behaviours, including smoking intensity, cessation rate and length, and relapse. The outcomes elucidate influence of smoking cessation attempt on incidence and prevalence of COPD by stage of the disease. Page A, Atkinson J, Heffernan M, McDonnell G, Hickie I. A decision-support tool to inform Australian strategies for preventing suicide and suicidal behaviour. Public Health Res Pract. 2017;27(2): e2721717. Atkinson J, Page A, Wells R, Milat A, Wilson A. A modelling tool for policy analysis to support the design of efficient and effective policy responses for complex public health problems. Implement Sci 2015;10:26 doi: 10.1186/s13012-015-0221-5. Integrating big data and simulation models to support health decision making: International data and system science expert Professor Nate Osgood describes how big data and dynamic simulation modelling is providing policy makers with unprecedented opportunities to address complex problems in public health.